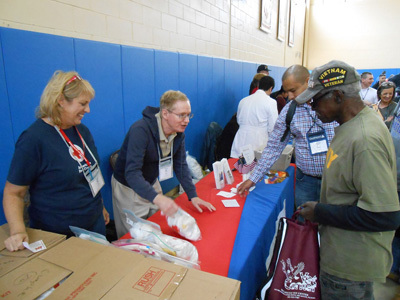 On November 3, 260 veterans participated in Community Hope’s Fifth Annual Stand Down in Morristown yesterday in Whippany. It was the largest turnout of female veterans in the past five years as veterans sought access to free Federal, State, public and private support including: social and personal care services, legal resources, health and dental screenings, flu shots, haircuts, clothing, lunch, housing referrals, and VA benefit information and employment assistance. Free transportation was also made available to ensure veterans had access to the Stand Down. Community Hope, the nonprofit organization hosting the event, is the leading charity in New Jersey and Eastern Pennsylvania providing housing and support services to homeless veterans and veteran families. CEO J. Michael Armstrong explained that the purpose of this annual event is to engage with our neediest veterans. “We have the programs in place to help homeless veterans and the Stand Down allows us to reach those that need the most help, try to engage them and earn their trust so that they are willing to accept the basic essentials they need and the services we provide,” he said. Armstrong cited that his agency served over 1,500 homeless veterans and their family members in the past year. U.S. 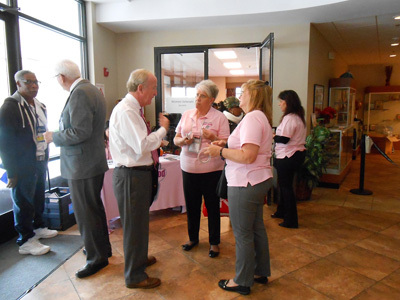 Congressman Rodney Frelinghuysen with resource providers. Veterans access resources, services and warm clothing at the Stand Down. 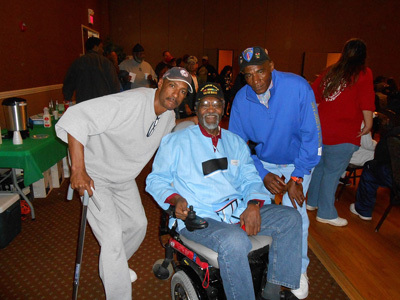 Veterans with Resource providers at Community Hope’s Fifth Annual Veterans Stand Down.